Old forest in damp ravines at low elevation. Moderately robust herb to 60 cm tall; stem decumbent to creeping, ca. 15 cm long, ea. 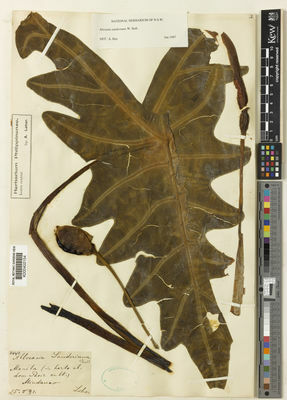 2 cm thick; leaves solitary to few together, interspersed with cataphylls (precise arrangement unclear from herbarium material); cataphylls papery, narrowly lanceolate; petiole to 60 cm long, sheathing in lower fifth to quarter; blade sagittate, deep glossy green adaxially, purple abaxially (?always), peltate for 25-30% of the length of the posterior lobes, to ea. 40 cm long x 20 cm wide; margin deeply undulate to sub-pinnatifid; anterior lobe to 24 cm long; anterior costa with 3-4 often but not always opposite primary lateral veins on each side diverging at ca. 80-100°, these somewhat acropetally deflected towards the tip of each segment; primary veins and costae white to yellowish; secondary veins emerging from the primary at a wide angle, thence deflected marginally, not or hardly forming interprimary collective veins; inflorescence mostly paired; peduncle slender, ea. 14-18 cm long; spathe 6-10 cm long, lower part 1.5-2 cm long, ovoid; limb 4-8 cm long, more or less canoe-shaped; spadix somewhat shorter than to half the length of the spathe, stipitate for ea. 5 mm; female zone ea. 1 cm long; ovaries ea. 2 cm diam., subglobose; stigma sessile, rather sharply 3-4-lobed; sterile interstice corresponding to spathe constriction, ea. 5 mm long, tapering distally; male zone 1.2 cm long, ea. 4-5 mm thick (dry); synandria rhombo-hexagonal with the thecae ventrally but hardly laterally joined; synconnective centrally impressed, marginally slightly exceeding but not capping the thecae; appendix short, equalling the male zone, cylindric then abruptly tapering in distal 3-4 mm, slightly narrower than male zone (dry).